Moët & Chandon Brut Impérial NV Champagne is a popular Champagne available from Tesco Groceries in 37.5cl to buy online. Visit Tesco Groceries for the best price for 37.5cl of Moët & Chandon Brut Impérial NV Champagne or compare prices on our other Champagne products. Since 1743, Moët & Chandon has been the definitive reference for champagne. The quality of its wines expresses the extent and diversity of its fabulous vineyard estate, the largest in Champagne, consisting predominantly of Premier and Grand Cru vineyards. Brut Impérial, the emblematic cuvée of the House since 1869, is the ultimate and universal expression of Moët & Chandon. A complete and elegant blend of more than 200 crus of Pinot Noir, Chardonnay and Pinot Meunier, Brut Impérial combines generosity and delicacy with maturity and freshness. 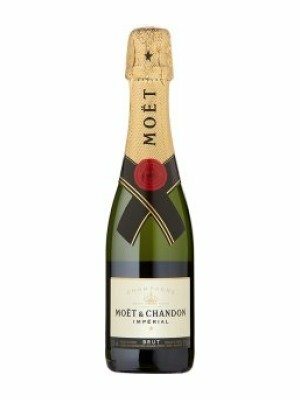 You can buy Moët & Chandon Brut Impérial NV Champagne online in most retailers and find it in the Champagne aisle in supermarkets but we found the best deals online for Moët & Chandon Brut Impérial NV Champagne in Tesco Groceries, Tesco Wine, DrinkSupermarket.com, and others. Compare the current price of Moët & Chandon Brut Impérial NV Champagne in 37.5cl size in the table of offers below. Simply click on the button to order Moët & Chandon Brut Impérial NV Champagne online now.